The Idaho Falls Braves took off for a big win against Salt Lake and Jimmie Pullins helped them get there. Pullins knocked a home run, one of three he hit that year, to help his Idaho Falls team to a 8-1 win in this July 1989 contest, according to The Deseret News. Pullins was in his second season as a pro. He went on to play in one more. He never made it out of rookie ball. 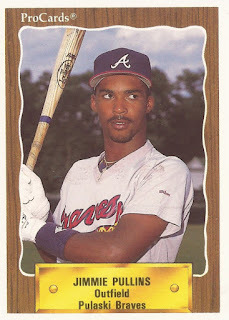 Pullins' career began in 1988, taken by the Braves in the sixth round of the draft out of Tyler High School in Texas. At Tyler, Pullins used his skills in multiple sports. He was All-District in baseball, All-State in football and he was a state high jump champ, according to is 1990 Best card. Pullins started his Braves career in the rookie Gulf Coast League. He got into 11 games, getting three hits in 24 at bats. He moved to rookie Idaho Falls for 1989. There, he got into 51 games and hit .194. For 1990, Pullins split time between rookie Pulaski and Idaho Falls. He hit .304 in 37 games at Idaho Falls. He also got 11 games at Pulaski. He had a run-scoring triple for Idaho Falls in a July game. It was his final season as a pro.